Find yourself laughing whenever a house-hunting couple on TV lists a mudroom as one of their must-haves? It’s my second favorite bit of ridiculousness on those shows (the first is the absolute need for a guest room when the entire viewing audience knows that no one is ever going to visit the family who just moved a $2,000 plane ride away). The reality (not reality TV) looks a lot different. Many city dwellers are lucky to have a coat closet or landing to stash their shoes. And those of us who live in the suburbs or somewhere without shared walls may have the space for a mudroom, but it may be overrun by laundry…or plastic kids’ vehicles…or it’s been turned into an office/gift-wrapping station/storage. Practical Chicagoans, here are some simple and stylish alternatives for storing and organizing your winter gear. 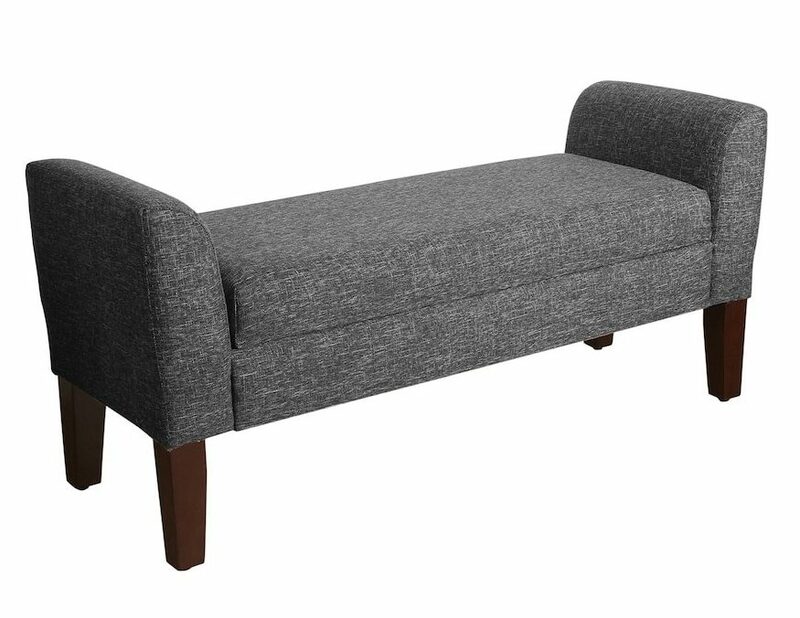 Nearly every store you know that sells furniture has storage benches, so find one that fits your space and your style. It will not only give you a place to stash winter gear, it will give you a place to sit while you put it all on. Some come with built-in shoe racks and dividers, but you can also add baskets or shoe trays underneath if you’re the DIY sort. 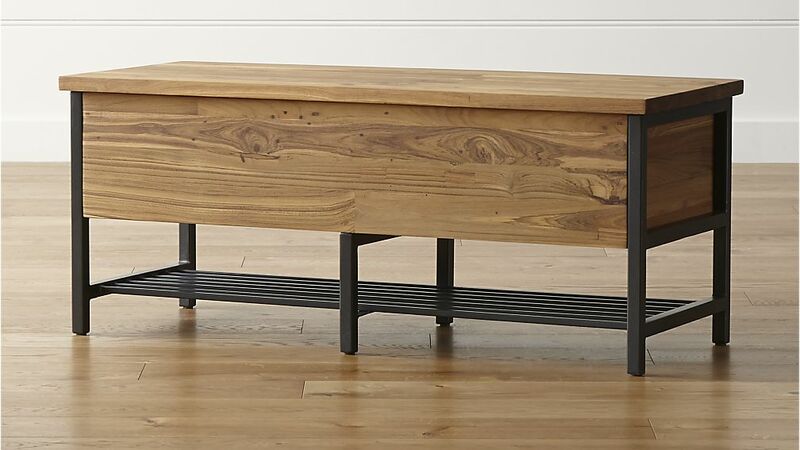 This warmed-up industrial-style bench is made of recycled teak and iron. Store shoes or bags underneath on a sleek rack. The best feature? The spacious trunk has a perforated metal bottom for airflow (no more stinky storage smell) or for drippy boots and caps. If you’re a minimalist even when it comes to mittens, a sleek storage settee might be all that you need. The interior has just enough space for your essentials plus a pair of tall boots. Tuck the bulkier and puffier items underneath or in a basket. Since you’re careful about what you keep, this won’t be enough to clutter up the look of this piece. Invest in a versatile shelving unit that can hold backpacks, laptop bags, important reminders and keys year-round and, still has compartments for seasonal wear. Swap out baseball caps and flip-flops for earmuffs and boots. This wooden shelving is slatted on one side to hold lots of small shoes, and the cubbies are a tidy place for kids (or you) to shove all the other stuff. Dedicate a space in your front hall or living area that blends so well, it looks like it was built right in. And if that feels like too much of a project or requires too much budget, just focus on adding a piece of furniture that blends with everything else in the room. 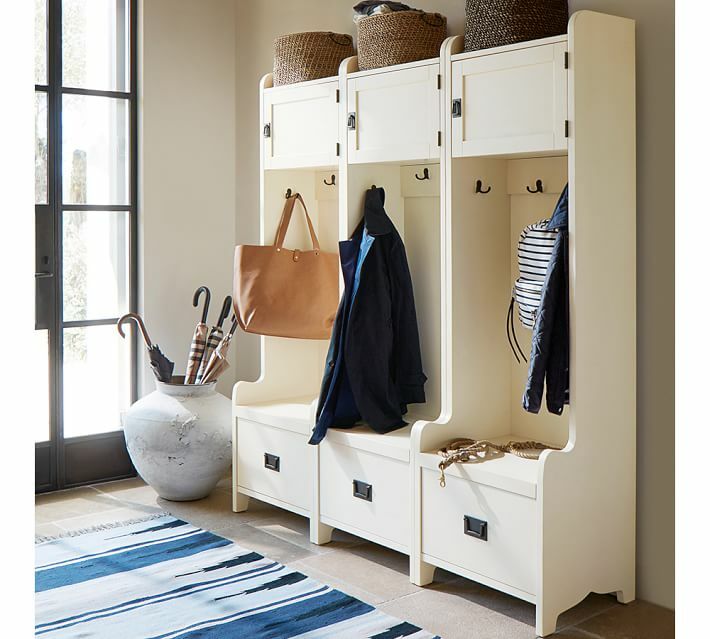 This customizable collection has pieces of different sizes that work together to stretch across the expanse of a wall or to create a hub for coats and boots in the corner. Measure your own space (three times, friends, THREE TIMES) and then pick the components that fit your needs best. You can always add on or reconfigure as your family (or puffy coat collection) grows. Coordinate it with your existing furniture in a cherry wood or antiqued whitewash, or paint it a bold color like orange to add some wow to your winter gear station. 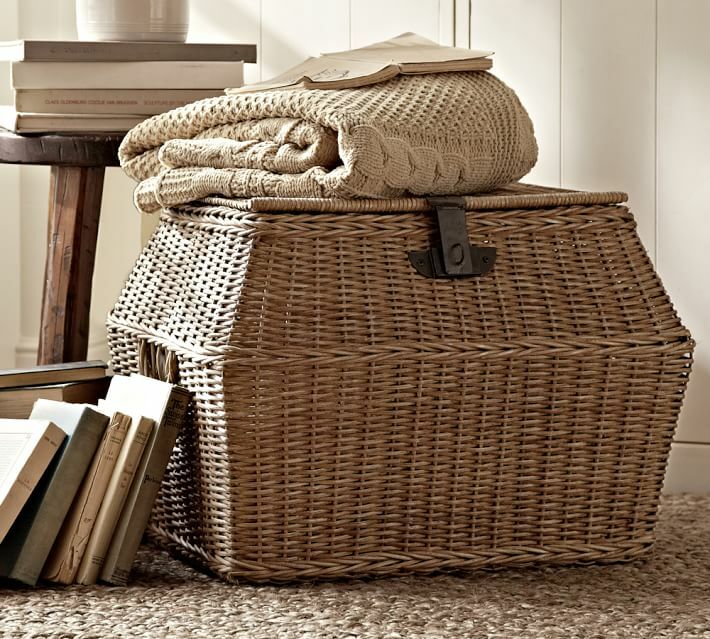 As a person who has hidden more than a hundred pairs of heels under a bed for more than a decade, I can tell you that a basket or bin on wheels is the very best investment if you don’t want to scratch up your hardwoods, irritate your neighbors, or snag your favorite sweater. Buy a basket for each category of winter gear so you can grab and go. If you might ever pop something damp into a basket or bin, line it first with something absorbent, like a shammy towel. No dust ruffle or oversized duvet? No problem, this rattan basket looks beautiful lined up under a bed. No one has to know how much junk is crammed in each one. A rolling underbed cart will also do if you’re the kind who loves to neatly fold or roll all of your scarves and sweaters. A longer, lidded, plastic bin works well if you’re not so neat or have a lot more to hide away. 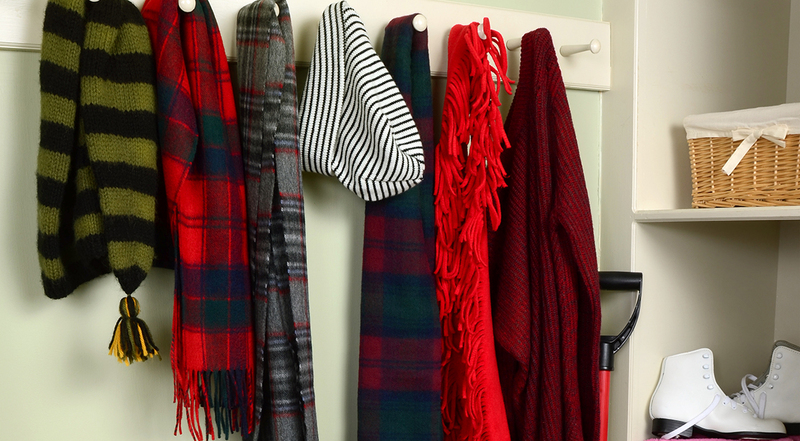 Is your coat closet overflowing? Or is the bench in your foyer piled high with down vests and Bears hats? A basket is a simple strategy for collecting things and hiding them away from guests, dust, and the KonMari clutter police. Choose one that is sturdy, has a lid, and isn’t so large you will miss the train because you have to dig so far down to find the other wool sock. How do you make your salt-stained, worn-heeled, half-soaked boots even sadder? Throw them in a giant heap just outside your front door. How do you keep them clean, stink-free and looking fabulous? Give them a boot stand or tray that will preserve their shape, aid in airing out, and look far more polished than a sloppy shoe pile. This stand is ideal if you cycle through tall or heavy boots, and is affordable enough that you can buy one for every member of your household (or four for yourself – no judgment). A boot tray is another savvy DIY trick – inexpensive, effective, and easy to find room for – even in crowded condos, small porches or barely existent entryways. This black zinc-finished galvanized tray will keep the mud and gunk from getting on your carpet and can be easily stored on a top shelf of a closet or under the bed during warm-weather months. Or choose this teak-oiled hardwood doormat that doubles and shoe stop, and can be wiped clean from winter remnants with a soap and cloth. And if you’re feeling extra generous, place a little basket full of cozy socks or slippers next to one of these so you and your guests never get cold feet on the way in.